WAIST HIGH: Happy 25th Birthday A Broken Frame. Happy 25th Birthday A Broken Frame. 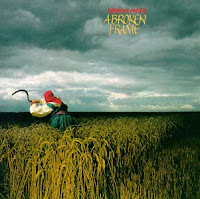 Waist High's favorite DM album A Broken Frame was the band's second studio release and their first following the departure of founder member Vince Clarke. Recording was completed in July 1982 with Martin Gore thrust into the position of chief songwriter, where he remained until 2001's Exciter. The music videos from A Broken Frame were directed by Julien Temple and have never been officially released, possibly hindering exposure for the album. "After the release of A Broken Frame, Depeche Mode went onto their first world tour, which included North America, Europe and the Far East." The best song on the album in this writer's humble opinion, "The Sun And The Rainfall," was never released as a single. "Markperkinsdesign" at amazon.co.uk reviews agrees, "But what makes this album essential for old school Mode fans, is 'The Sun & the Rainfall,' a haunting beauitful song."